Your future is dependent on keys. Cryptocurrencies use these digital cryptographic keys to secure funds. Early companies in the cryptocurrency space manage these keys for you, acting as a custodian. This approach is great for fast setup, but it severely limits your control and experience (kind of like AOL vs. the full Internet). To gain the real benefits of cryptocurrency, you must manage your own keys. But managing keys is not easy. Keys can be lost accidentally or in a disaster, and holding full power from keys opens you up to new risks of theft. 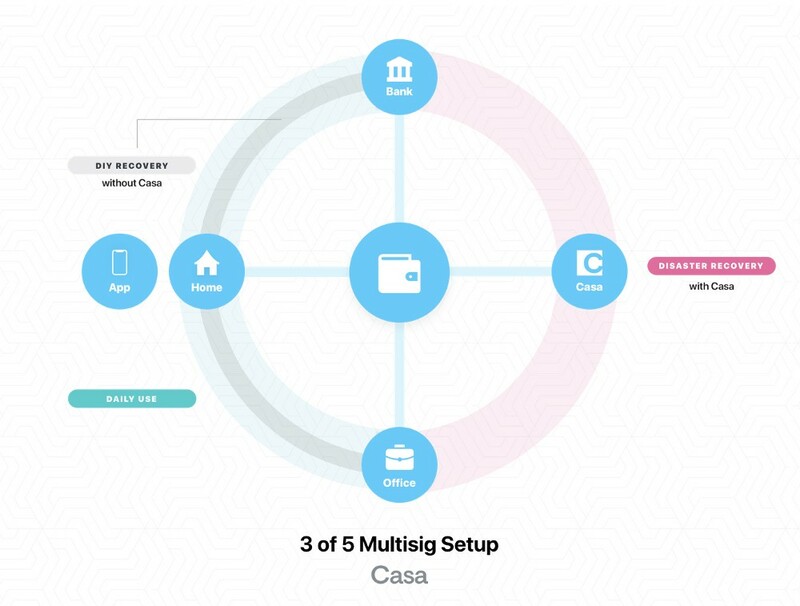 We created Casa to help you manage keys. Using a precise mix of world-class design, engineering and service expertise, Casa enables you to maximize the benefits of cryptocurrency while minimizing the risks of holding keys. Our first product is the ultimate personal HODL setup: 3-of-5 multi-signature key software with 24/7 support. Keys spread across devices on a mobile phone, three hardware wallets and our Casa Key Recovery Service (KRS). This setup gives you full control while addressing risk of theft, accidents, disasters and more. Multi-signature means that multiple signatures are required to execute a transaction. In our case, there are five (5) total keys, and any combination of three (3) keys can be used to execute a transaction. one at Home, one at an Office (or other daily location), and one inside a Bank safety deposit box (or other secure location). You can use your favorite hardware wallet with Casa. Today we support Trezor and Ledger devices, and we plan to support all other devices requested by clients. Another one of five keys is held on your mobile device using the Casa app. This key travels with you as your mobile phone does. We would not normally recommend keeping a key on the phone, but we believe the strongly improved user experience is worth it. The risks of keeping a key on a phone are minimized in two ways: 1) we store the key in the secure enclave and 2) we use multi-signature (with keys from other devices and locations required). The last one of the five keys is held securely by Casa. We use this last key to help you recover in an emergency such as a fire, accident or theft. We also use this key to assist with end-of-life recovery and inheritance procedures. You have full control by holding 4-of-5 total keys. The risk of theft is reduced by spreading keys across locations (and never having more than two keys in one location) because more time and travel means a higher chance of thieves being caught. Casa can help you in emergencies because we hold 1-of-5 keys. Casa can never access your funds because we hold only one key. And any thieves attacking Casa can also never access your funds. Bitcoin First. More Currencies Soon. Casa is a Bitcoin first company. Casa will support many other cryptocurrencies, but we will always prioritize Bitcoin support. Bitcoin is the OG and still leads the market, and at Casa we strongly believe that if Bitcoin goes away, so do all other cryptocurrencies (the only exception to this is the unlikely case that another cryptocurrency out-Bitcoins Bitcoin — then we will prioritize that). Casa is live on Bitcoin mainnet today with SegWit, full HD multi-address support, signature logging, wallet recovery and much more. We are actively onboarding customers for Bitcoin only. All existing Casa clients will gain access to other currencies as soon as our integrations are production ready. Ethereum, ERC20 and ERC 721 support is next, driven by client demand. Litecoin, ZCash, Monero and others will follow. Want support for your coin? From design to engineering to client service — Casa has assembled the best team in the industry. We can’t wait to announce more in the coming weeks! Ready to build with the Casa team?